Pursuant to a permit obtained from the New York State Department of Environmental Conservation, the Village is implementing a Stormwater Management Program to reduce the impact on our tidal and freshwater wetlands from storm water runoff. A major component of this program is the reduction of pollutants, such as pathogen containing pet wastes, trash, petroleum products, and nutrients and toxics found in lawn care and gardening products from being discarded into or from leaching into the Village’s drainage systems. Also, feeding geese and encouraging them to become “year-around residents” creates a mess on our lawns, athletic fields and golf courses and contributes pollution to our ponds and bays. To meet the program goals, the Village is asking residents to get involved and help. By being careful with waste disposal, chemical use, cleaning up after our pets and not feeding waterfowl or pigeons, we can reduce the impairments of the receiving waters and improve the aesthetics of the community. While we all love our “feathered friends”, feeding them interrupts the natural migratory cycle. Birds that would normally migrate south in the winter to find food, take up residence if food is “artificially” provided. Further, these resident birds attract migrating birds that in turn will stay if food is present. The result of artificial waterfowl feeding can be large flocks of resident birds that create a nuisance in our parks, athletic fields, golf courses and lawns, and place an extra pollution load on our waterways. Once feeding is discontinued, geese will disperse and revert to higher quality natural foods. Geese that depend on human handouts are also less likely to migrate when severe winter weather arrives, and are more vulnerable to disease. · Mow your lawn only as needed. If the grass has gotten too tall, don't mow it down all at one time. Mow gradually, cutting no more than an inch off with the first mowing. Allow the lawn to recover for a day or two, and then trim another inch. Continue cutting an inch at a time until you reach the desired height. · Water wisely. Don't water on a timer. Some grasses need more water than others, so figure out what kind of grass you have before you decide to water it frequently. When you do water, soak the grass through to the roots, not just the top of the blades. · Use slow-release, organic fertilizers. Most lawn and garden centers now offer several organic fertilizers along with the more standard varieties. · Keep all toxic materials in a locked cabinet or garden shed. Garbage should be kept in containers with lids that are animal proof. Open containers or plastic garbage bags provide an inviting target for raccoons and other wildlife. We can keep our garbage from being strewn about the neighborhood and ending up in our waterways by using the right containers. It is important to recycle paper, plastics, glass, and metals. Reusing these materials and keeping them out of our environment is one way to keep our waters clean. Please help by separating paper, glass, plastics and metals and putting them out on the designated day. For information click to view our garbage and recycling webpage. The S.T.O.P. (Stop Throwing Out Pollutants) program offers residents of North Hempstead the opportunity to dispose of their household hazardous waste in an environmentally friendly manner. Many people do not realize that ordinary household products, such as aerosols and cleaners, can be corrosive, explosive, or toxic if mixed indiscriminately with regular household garbage. The Town of North Hempstead’s S.T.O.P. collection and motor oil recycling programs are available to all Village residents. I urge all residents to take advantage of both programs. Under the S.T.O.P. program, the Town will accept for disposal chemicals such as pesticides, aerosol cans, household cleaners and used motor oil. We can all work together to keep our Village beautiful and our waterways clean. "Stormwater Pollution and Green Infrastructure Solutions"
To learn more about keeping our environment clean, please visit www.nassauswcd.org. As you walk around the Village you may notice storm drains cut into the curb and meant to remove stormwater quickly from streets and surrounding areas. These drains are meant only for rain water and snow melt (cumulatively stormwater) to move through and are not trash receptacles. Anything that is poured down or placed into these drains leads to our beautiful Manhasset Bay or into groundwater. Do not place pet waste, leftover lawn fertilizer, used oil, food scraps, trash, or anything else into these storm drains. Pet waste can be disposed of in your trash; lawn fertilizer can be swept up and kept to be applied later. Used oil can often be returned to stores that sell motor oil. You can also call the Town’s 311 number to inquire about hazardous material collections going on throughout the year. Certain food scraps can be composted and the rest can be thrown out in your regular garbage. 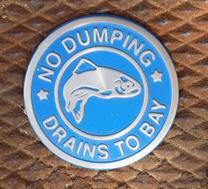 Some of our storm drains are marked with a stainless steel medallion (like the one pictured below) that says “no dumping, drains to bay” to serve as a reminder that only rain should go down the drain. The Village of Thomaston is a member of the Manhasset Bay Protection Committee, but you may not be fully aware of what the Committee is or what it does. Two years later, 13 municipalities around Manhasset Bay did the same (now there are 15 members). Today, nearly every major harbor or bay along Long Island has done the same. The idea was simple: since pollutants know no boundary and since no one municipality can solve the water quality issues of the Bay on its own, it made sense to tackle them together. Larger municipalities (County and Towns) can bring certain resources to the table and smaller municipalities (Villages) can help with local knowledge. develop training programs; serve on regional and local advisory committees; and advise municipalities on new technologies and developments allowed each municipality to improve water quality at minimal cost. This made even more sense once New York State began mandating many of these activities under its stormwater permit regulations. and wildlife has returned including bottlenose dolphins; beluga and humpback whales; bald eagles; Peregrine falcons; diamondback terrapins; and others. recently signed the 2015 Manhasset Bay Protection Committee Inter-Municipal Agreement, which will keep the Committee functioning and moving forward for another five years.